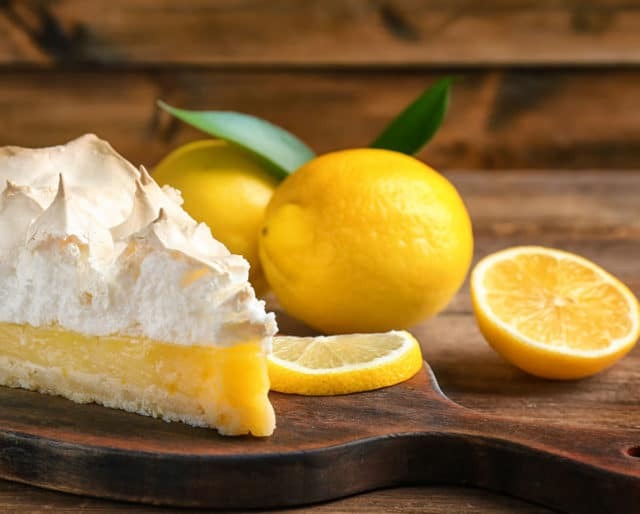 We hope your sweet tooth is ready to celebrate National Lemon Cream Pie Day on November 29th. We know this time of year is more typically associated with pumpkin pie, but honestly we’ll take any excuse to celebrate any kind of pie—especially a pie that’s been around for thousands of years. Historians say lemon desserts have been around since the Middle Ages! Whipped cream, on the other hand, is a relative newcomer: it didn’t show up until the 16th century. It first appeared in recipes in Italy in the mid-1500s and then traveled to France and showed up in recipes there just after 1600. Somewhere between then and now, someone had the brilliant idea to marry them together in a way that’s basically sunshine baked into a pie dish. So grab your fork and let’s dig in to this delectable holiday. Cream pies of all kinds—chocolate, banana, coconut—are a classic diner dessert. We happen to think this no-frills setting only enhances the enjoyment of a slice of pie. Find your local greasy spoon, grab a seat at the counter, and dig in. No matter whether you choose to go the above no-bake route or take on a more complicated recipe, lemon cream pies are basically fail-proof. They’re also a choose-your-own-adventure baking experience. You can go with a classic butter crust, or mix it up with a graham cracker crust. Want some extra tang to back up the lemon? Mix some sour cream into the filling. Feel like it needs a little extra elegance? Shave some white chocolate on top, or even try sprinkling it with coconut flakes. If you feel like pairing an adult beverage with your pie (who wouldn’t?) try a Lemon Drop: pour vodka, fresh lemon juice, and sweetener (triple sec, simple syrup, or just plain sugar) into a cocktail shaker, give it a good shake, strain into a glass, and garnish with a fresh lemon slice. It’s elegant, and deceptively easy. Fine, there’s nothing as American as apple pie, but we’d put lemon cream high up on the list of classic and timeless desserts as well. And honestly, between the two of them, apple pie just sounds a bit boring, doesn’t it? The main flavor profile is lemon, right? Well, lemons are an excellent source of vitamin C, are alkalizing for your body, and are naturally antibacterial. They can also help you absorb iron, stimulate your liver, and might even have cancer-fighting properties. Sure, you could get these benefits by drinking lemon water, but pie is just more fun. High-end restaurants can fancy ‘em up, but lemon cream pies are about as simple as they come. If you’re craving one but feeling especially lazy, it’s as simple as a trip to the grocery store to pick up premade pie crust, fresh lemons, lemon pudding mix, and a can of whipped cream. Presto: no-bake, almost-no-effort lemon cream pie!